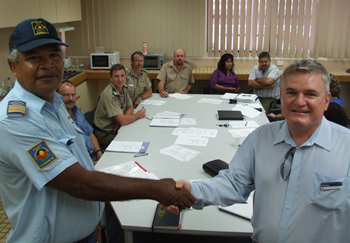 Charles Darwin University at Katherine has commenced training of Night Patrol Officers as part of a $100,000 package from the Department of Education, Employment and Training. The training will allow people in remote communities to gain the skills needed to assist in the policing and management of their communities. The first students – from the community of Kalano – are learning first aid, occupational health and safety and communications. Other remote communities at Ngukurr and Yarralin are expected to receive training over the next few weeks. The Community Patrol Units have been packaged together from the Certificate II course in Community Services. Students will receive a Statement of Attainment after successful completion of the units. The students will also have the option of completing additional units to receive a Certificate II in Community Services. Bronte Cooper, CDU’s Remote Field Officer said the course had been developed in partnership with DEET. Commander Greg Dowd, the NT Police representative on the Katherine Harmony Group executive the training was an essential part of community development.